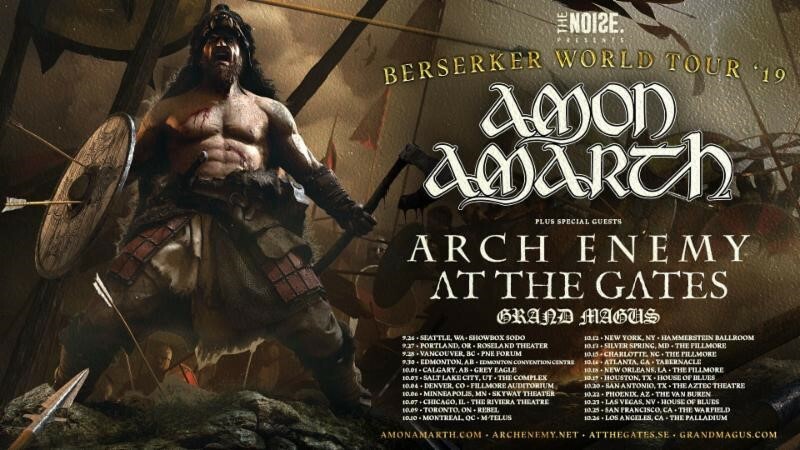 Swedish melodic death metal band Arch Enemy announce North American tour today supporting Amon Amarth. The massive tour starts on September 26th in Seattle, WA and wraps on October 26th in Los Angeles. Fans can purchase pre-sale tickets on Tuesday, April 16th via Amon Amarth and Citi pre-sale starting at 10AM. Ticketmaster, Live Nation, venue, radio, and Blabbermouth (password BLABBER) pre-sales will be available on Wednesday, April 17th starting at 10AM. Finally, tickets go on sale to the general public on Friday, April 19th at 10AM. Arch Enemy continues to tour in support of their 2017 chart-topping tenth full-length album Will To Power released by Century Media Records. Will To Power is available for purchase HERE. A new re-press of Will To Power as a limited edition “Tour Exclusive” yellow with red swirls vinyl will be available for sale at the merch booth doing the tour. The band is currently working on their new album. More details to will be announced shortly. Released in 2017, Arch Enemy’s tenth album was the ultimate statement of heavy metal supremacy from a band that are still growing in stature year over year. The critically acclaimed album is the first the band recorded with their current line-up: Alissa White-Gluz (vocals,) Michael Amott (guitars,) Jeff Loomis (guitars,) Sharlee D’Angelo (bass,) Daniel Erlandsson (drums). Achieving longevity is the toughest challenge that faces any band, but Arch Enemy have long since established themselves as a permanent fixture on the global metal scene and continue to uphold and celebrate the heavy metal code. Arch Enemy is Alissa White-Gluz (vocals), Michael Amott (guitar, keyboard), Daniel Erlandsson (drums), Sharlee D’Angelo (bass), and Jeff Loomis (guitar).